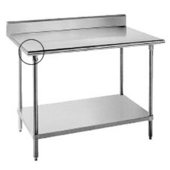 Our Advance Tabco kitchen carts, countertops, pot racks, work tables, sinks and shelves are made with superior craftsmanship, using 18-gauge, 16-gauge and 14-gauge series 304 stainless steel, which is resistant to high temperatures as well as oxidation and corrosion. These professional stainless steel kitchen products have the strength and durability of their commercial counterparts, but feature fine attention to detail with refined edges and a satin finish not found in products designed for food service. Some of the products also have highlighted edges for added decorative appeal. Advance Tabco products combine high-quality construction with flawless design, making them a perfect fit for today’s busy lifestyles and well-appointed homes. 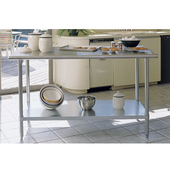 Advance Tabco chef tables offer prime work and storage space in your home or restaurant kitchen. 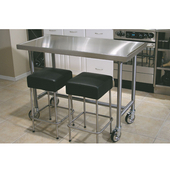 The Counter Top Edge table is available in six sizes and comes with your choice of a stainless steel rear bar, center bar or an under shelf. The Bull Nose chef table has a top with distinctive, rounded edges. The tables are available with or without a backsplash and come in six sizes to fit in any kitchen. 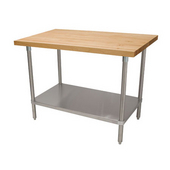 The Maple Top chef table has a 2” thick hardwood maple top and a stainless steel frame. Optional casters make it a mobile workstation. The Enclosed Base chef’s table gives you room to work as well as storage space for your kitchen and food items. 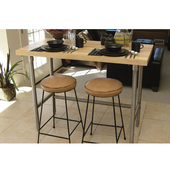 The table is available with a flat top or a backsplash and comes in six sizes to suit any kitchen.